A video from The Verge shows the iPhone crash video in action. The modern electronic is a far cry from the old days of tubes and transistors. These days, things are way more delicate than they used to be, and the funniest things can become big problems for smartphone owners. Every time an operating system gets updated, problems arise. Even something as simple as watching a video clip sent by a friend can make one of the most expensive and popular phones on the market choke up and die. Opening a specific video file in iMessage causes the iPhone to glitch and crash. The video plays, and 10 seconds later, the phone crashes. A hard reboot brings it back to life, with no apparent damage to the phone. Of course, this isn’t the first bug with iMessage. Only last year, if a user was sent a string of jibberish letters, it would cause the iPhone to crash. There were also issues with Safari crashing. 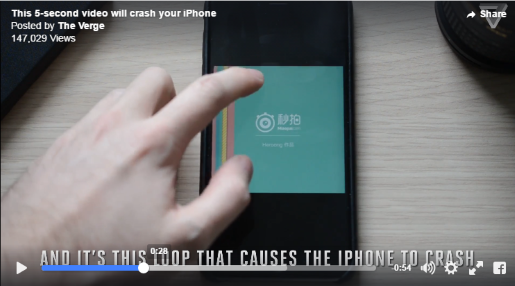 Now, apparently, a video sent to iPhone users will crash their phones, and according to Reddit, it’s not just via iMessage, but other text apps like WhatsApp. Granted, it just make the phone crash, not catch on fire, but… who knows what else it might do? If a video file can cause those kind of problems, there’s no telling what you could get a properly coded video file to do to a phone.